(Nanowerk News) Medium-sized waves can break wind turbines at sea like matches. These waves occur even in small storms, which are quite common in the Norwegian Sea. "The problem is, we still do not know exactly when the wind turbines may break," says Professor John Grue from the Department of Mathematics at the University of Oslo. Grue is one of the world's foremost experts on wave research. In 1989 he discovered an inexplicable wave phenomenon called ringing, which is a special type of vibration that occurs when choppy waves hit marine installations. The discovery was made in a 25-metre long wave laboratory located in the basement of the mathematics building at Blindern Campus. UNFORTUNATE WAVE POWER: When waves above 13 metres hit wind turbines, an unfortunate force arises at the rear of the turbine. This is called ringing. John Grue is now looking for a general mathematical formula that can explain the special phenomenon. So far scientists have studied ringing in small and large waves, but as it turns out, ringing is more common in medium-size waves. For wind turbines at sea with a cylinder diameter of eight metres, the worst waves are those that are more than 13 metres high and have an 11-second interval between them. The ringing problem may increase significantly in the years ahead. There are plans to build tens of thousands of wind turbines at sea. "If we do not take ringing into consideration, offshore wind turbine parks can lead to financial ruin," warns John Grue. Today, the largest windmill parks at sea are outside the coasts of Denmark and Great Britain. They are nevertheless like small miniatures compared to Statkraft and Statoil's enormous plans on the Dogger Bank outside Scotland. This windmill park is to produce as much electricity as 60 to 90 Alta power plants. A windmill park with the capacity of two Alta power plants will be built outside Møre og Romsdal. "Thus far it has not been possible to measure the force exerted by ringing. Laboratory measurements show that the biggest vibrations in the wind turbines occur just after the wave has passed and not when the wave hits the turbine. Right after the crest of the wave has passed, a second force hits the structure. If the second force resonates with the structural frequency of the wind turbine, the vibration is strong. 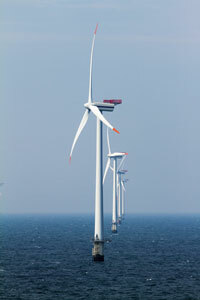 This means that the wind turbine is first exposed to one force, and is then shaken by another force. When specific types of waves are repeated this causes the wear to be especially pronounced. This increases the danger of fatigue." All structures have their own vibration frequencies, whether they are wind turbines, bridges, oil rigs or vessels. When the vibration matches the structural frequency, things get tough. This phenomenon is called resonance, and can be compared to the steady march of soldiers on a bridge. If the soldiers march in time with the structural frequency of the bridge, it can collapse. The Norwegian University of Science and Technology and the Massachusetts Institute of Technology (MIT) have already made a number of calculations of ringing. Ecole Centrale Marseille and the French Bureau Veritas have also made such calculations. Det Norske Veritas is among those who use versions of these models. "Current models are the best we have, but the estimates are too rough and erroneous. The theories are applied far outside of their area of validity. This means that we cannot calculate the fatigue adequately." Ringing is not related to turbulence. Ringing is systematic and is about high underpressure at back of the cylinder. Internationally, very little has been done on this phenomenon. John Grue now has two Doctoral Research Fellows calculating these movements. He also collaborates with the Danish research community on wind power at Risø National Laboratory and the Technical University of Denmark. "Ringing is very difficult to calculate. There is great uncertainty. We want more precise descriptions of the physics of ringing. We are now trying sophisticated surface elevation models and complex calculations to reproduce these measurements accurately. We want to show that the ringing force arises systematically according to a general mathematical formula." Saga Petroleum has previously conducted an extensive set of measurements of the ringing force in waves. "These fit our measurements very well", says Grue. The scientists must also consider whether the installations are in deep or shallow waters. "The structural frequency also depends on the conditions on the seabed. You can compare it to a flagpole in a storm. The flag pole vibrates differently depending on whether the pole is fixed in concrete or on softer ground." "There has been no research on the connection between vibrations and the conditions on the seabed." Ringing does not just harm wind turbines. Ringing has already been a great problem for the oil industry. The designers of the YME platform did not tak ringing into account, and lost NOK 12 billion. "It is possible to build your way out of the ringing problem by strengthening the oil rigs. However, it is not financially profitable to do the same with wind turbines", says John Grue. Arne Nestegård, Chief Specialist in hydrodynamics at Det Norske Veritas, confirms to Apollon that wind turbines at moderate depths may be exposed to high-frequency resonant oscillations if the waves are extreme, but they safeguard against this. Nestegård says that in the past twenty years, Veritas has developed ringing models and that they now work on improving the models for wind turbines at sea.